It has been awhile since I've done a Real Food post. "Real Food February" is now "Real Food"-no more month time frame to stress me out : ) I actually have a ton of pictures all lined up and ready to be blogged about--so, as soon as I get those finished, expect a flurry of delicious recipes coming your way. This one is great--easy, fresh, and perfect to share at a summer picnic. You'll love it. 1. Prepare rice according to package directions, or using a rice cooker. Allow to cool to room temperature (can be prepared a day in advance). 2. Whisk the olive oil, lemon juice, garlic, and sugar together. 3. 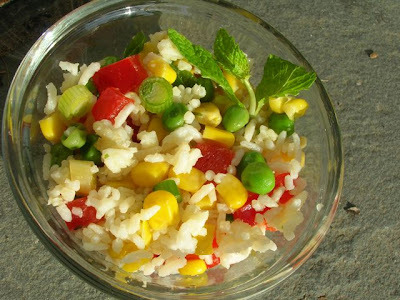 Mix the rice, green onions, peppers, corn, peas, and mint in a large bowl. Add the dressing and mix well. Cover and chill at least 1 hour before serving. oh how i love these posts!! this one is easy peasy and the kids will love it. thanks kelly! I'm glad you got back to posting real food. If you haven't already check out Rodale's Whole Foods Cookbook, its my bible in the kitchen.